Last August I bought ARK: Survival Evolved, the fun new early access dinosaur survival game, and just barely made it to the character creation screen before having to ask Steam for a refund, since it demanded way too much of my old, laggy laptop. This week, with my new iMac and 24 GB of RAM, I bought the game for a second time and tried again. ARK: Survival Evolved is set on a 48 square kilometer prehistoric island (apparently called “ARK”) full of dinosaurs. Well, I say prehistoric; there are hints that things are not exactly as ancient as you might think. First, when you wake up on the beach, naked and shivering, you find a glowing crystal implanted in your wrist. This is where you access your inventory and crafting menu. Second, there are massive glowing towers in the distance, and every so often beams of light will descend from the heavens, carrying supplies. 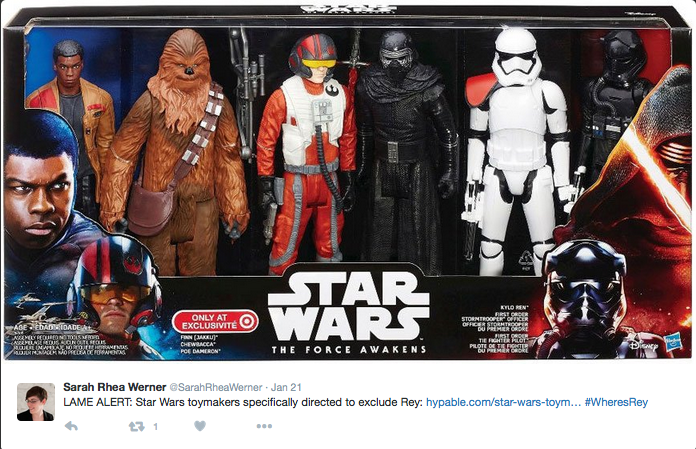 Earlier this month, Disney expressed their shock at the #WheresRey campaign on Twitter. Wait, people want girls in their toys? What do you mean, people liked the main protagonist of The Force Awakens? 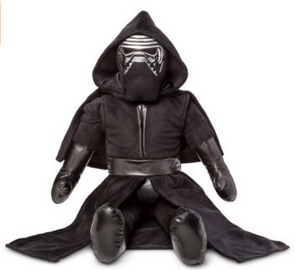 Don’t you want to snuggle with a Kylo Ren cuddle buddy pillow instead? Slip between some Kylo Ren sheets? Maybe wear his mask? Dress up like him? Wear a t-shirt with his face on it? Wave his lightsaber around? Isn’t Kylo Ren such a badass? Finn too, I guess. Maybe Poe Dameron as well, although he didn’t play a major part in the movie. But Rey? Don’t you know she has girl parts? The [toy industry] insider, who was at those meetings, described how initial versions of many of the products presented to Lucasfilm featured Rey prominently. At first, discussions were positive, but as the meetings wore on, one or more individuals raised concerns about the presence of female characters in the Star Wars products. Eventually, the product vendors were specifically directed to exclude the Rey character from all Star Wars-related merchandise, said the insider. Meanwhile Hasbro is releasing toys like the Star Wars Monopoly game, which has every character except Rey, and a set of action figures which doesn’t include Rey or Captain Phasma but does include a faceless Stormtrooper and a faceless TIE fighter pilot. Maybe you can pretend there’s a girl under that helmet? Then there was the toy Millennium Falcon, which was released with Finn, Chewbacca, and BB-8, none of whom actually piloted the ship in the movie. Who did pilot it, you ask? Come on. You know the answer already. Hint: her name starts with an R.
It’s not like any of that is new, though. After Guardians of the Galaxy, it was impossible to find a Gamora toy. Ditto with Black Widow after the Avengers movie. 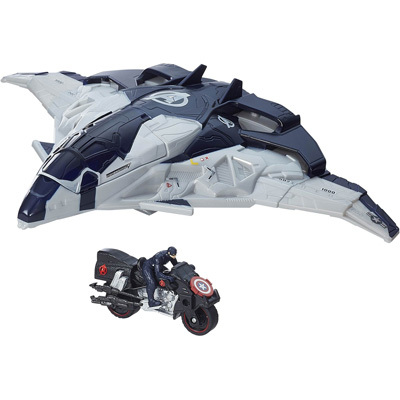 You know that iconic scene in Avengers 2 where Black Widow drops out of the cargo hold of a jet in a motorcycle? You can actually buy that toy if you like—as long as you don’t mind Captain America or Iron Man or Ultron riding the motorcycle instead. 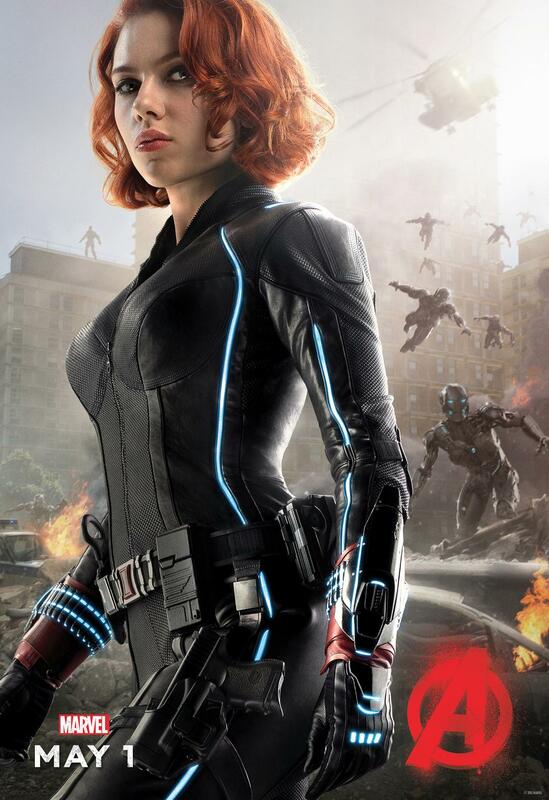 Disney said that they left Black Widow out of merchandise because she wears a tight-fitting black body suit, and that’s too sexual for little kids. Captain America wears a tight-fitting body suit too, but that doesn’t count, most likely because he doesn’t have breasts. Leaving the women out of merchandise is a calculated strategy by toy companies. In the 1970s, toys were largely gender neutral. It wasn’t until Reagan deregulated advertising to children in the early 1980s that companies began to aggressively segregate the toy market by gender. They realized that if they make boy toys and girl toys, then parents would have to buy twice as many toys for their little darlings. This strategy doesn’t just work for children, either; there are feminine and masculine versions of deodorant, razors, shampoo, soap, hand lotion, pens, pepper spray, guns, etc. Not to mention the new fad of “broga” and “brosé” and “bromance” and “guyliner” and whatever else you can put a masculine prefix onto. This way, a husband and wife won’t share the same gendered products, and better yet, companies can charge more for the female version. No, really. It’s called a pink tax. Of course, people can and do buy outside of the narrow range of things targeted toward their gender, but the staggering majority of consumers don’t. If it wasn’t a lucrative strategy, companies wouldn’t do it. There have been some attempts recently to fight back against this trend, such as Target getting rid of ‘boy’ and ‘girl’ toy sections. Oddly, some people were really upset about this. 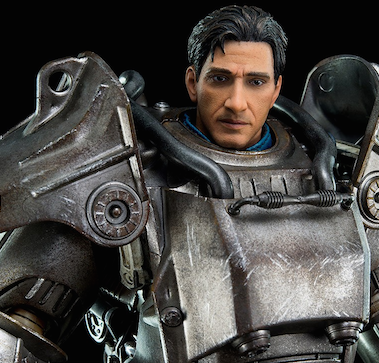 Bethesda just released promotional photos of an extremely lifelike model of the power armor from Fallout 4. The armor is being worn by the default white male vault dweller that the game starts with. Of course, Fallout 4 allows you to heavily edit your character’s appearance and choose between two genders and multiple ethnicities, so this model looks nothing like the vault dweller I know and love. Maybe there were some players who just stuck with the default character, but if I had to guess, I’d bet that those players looked a lot like the default to begin with. I’m aware that Bethesda wasn’t likely to make a version for every character option available. Even if they did release a female version, odds are astronomical that she would be white. The point is, that model is meant for the target demographic, just as the Star Wars Monopoly board was, and the Millennium Falcon, and the Avengers 2 motorcycle, and all those action figure sets. 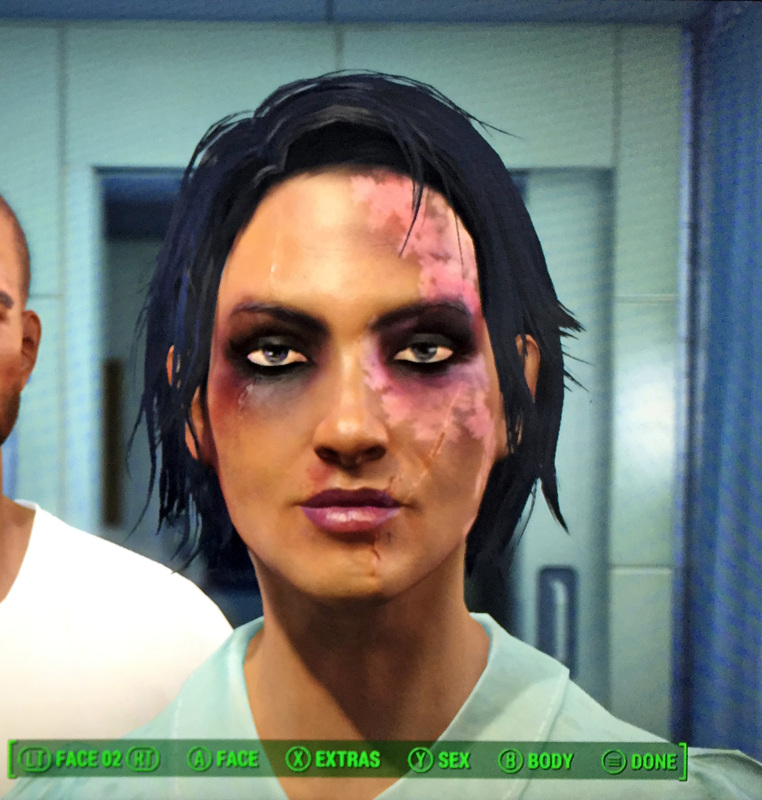 For my Fallout 4 character, life in pre-apocalyptic suburbia was hard. Something similar happened with the Mass Effect trilogy. Like Fallout 4, you can choose between male and female characters, but all of the promotional materials for ME 1 and 2 exclusively featured the male version of Commander Shepherd. BioWare recently said that the female version was actually their original concept, though they’d intended to have both male and female options in the final game. Still, they only coded Commander Shepherd with male motion capture data, made obvious in this scene of her inability to sit in a dress. BioWare explained that only 18% of players played as a female Commander Shepherd. Even the nickname given by fans to the female version of Commander Shepherd—FemShep—implies that she’s the aberration, the female version of default Shepherd. No one ever calls the male version BroShep, because it’s assumed that he’s male. It wasn’t until Mass Effect 3 that FemShep was included in promotional materials, and only because fans requested it. That statement sounds strangely familiar, doesn’t it? At the end of their apology, Hasbro said that they’ll re-release the Monopoly game with Rey included, and they’ll make sure to get some more Rey merchandise going. It’s a good start, but it remains to be seen whether the next big action movie to come out will have learned that lesson. How many movies and video games will it take before companies stop being surprised at fans’ interest in the female characters? How long before merchandise involving non-male characters is the default, not the last minute add-on?